Max Severance Thickness: 1 "
Max Cut Thickness: 3/4 "
Ramsond introduces its redesigned inverter series SUPER 250PY. It is an exciting new innovation that combines a 50 Amp air plasma cutter, a 200 Amp TIG welder and a 200 Amp MMA (ARC) Welder into a handsome, rugged, compact and light weight package. What makes this unit truly unique is the added dual AC/DCTIG weld function and PULSE control. 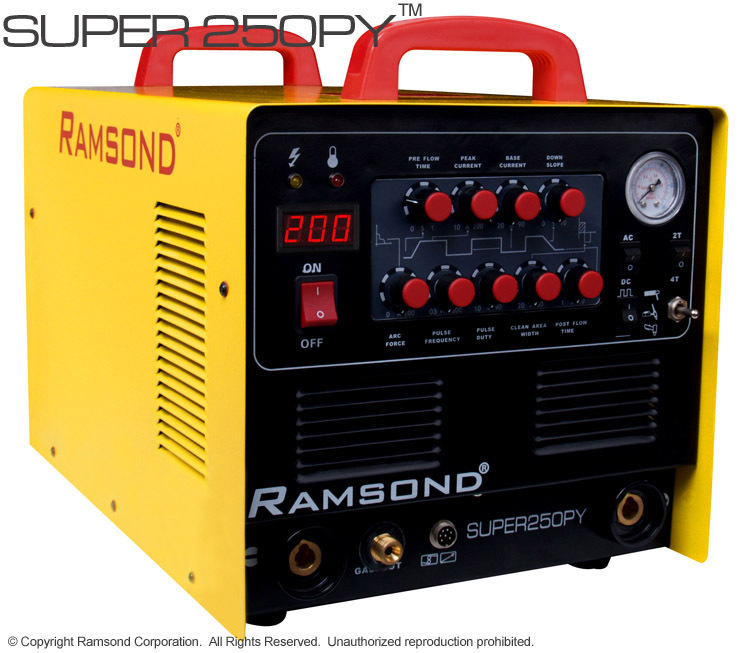 The Ramsond SUPER 250PY utilizes microprocessor controlled digital inverter technology, which not only makes it lighter and more compact, but also renders the welding and cutting current far more stable, accurate and easy to adjust. The arc is also more straight and the heat more concentrated, resulting in professional quality finishes. 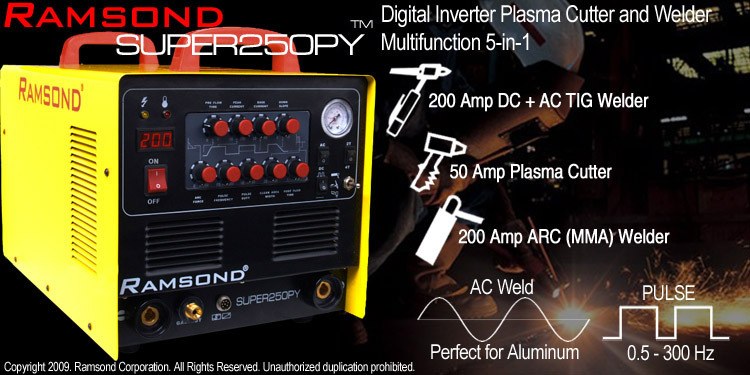 In addition to the standard DC TIG function (suitable for steel and other non-ferrous metals), the Ramsond SUPER 250PY offers the unique feature of AC TIG-welding. Aluminum, copper and magnesium and their alloys are best welded using alternating current (AC). AC TIG should be utilized when welding aluminum due to its unique properties. Aluminum, when exposed to welding, forms an oxide layer on the surface (commonly called sapphire), which can contaminate the weld. This oxide layer must be removed for welding to occur. With AC welding function of Ramsond SUPER 250PY, the power source switches (alternates) the polarity of the arc between positive and negative. When the polarity of the arc is positive, current flows from the work surface towards the electrode, producing a cleaning effect that blasts the oxide (sapphire) away from the surface. When the arc switches back to negative, energy flows from the electrode to the work surface producing heat that melts the metal. By increasing or decreasing the duration of the positive or negative phase of the AC cycle, the cleaning and welding characteristics of the arc can be modified. AC TIG welding is a multi purpose process, which offers the user great flexibility. By changing the diameter of the tungsten electrode, welding may be performed with a wide range of heat input at different thicknesses. A few TIG welders in the market, including the Ramsond SUPER250PY, have a "square wave" or "PULSE" control feature that allows the electrode negative (EN) portion of the AC cycle to be increased up to 90 percent. By increasing the negative phase, the AC cycle provides greater heat penetration, faster welding and narrows the weld bead. 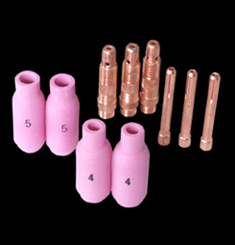 It also allows the use of a smaller diameter tungsten electrode to more precisely direct the heat in a confined area. Reducing the negative phase of the cycle produces greater cleaning action to remove heavier oxidation, and reduces heat penetration when welding thin castings. In the PULSE-current mode, the welding current rapidly alternates between two levels. The noise produced during this process is a noticeable pulsating/waving sound. The higher current state is known as the pulse current, while the lower current level is called the background current. During the period of PULSE current, the weld area is heated and fusion occurs. Upon dropping to the background current, the weld area is allowed to cool and solidify. PULSE current has a number of advantages, including lower heat input and consequently a reduction in distortion and warping in thin work pieces. In addition, it allows for greater control of the weld pool, and can increase weld penetration, welding speed, and quality. The RAMSOND SUPER250PY allows the operator to program a specific rate and magnitude of current and frequency variations, making it useful for specialized applications. PULSE current is also most useful when welding dissimilar metals (e.g. welding steel to aluminum) . In case of dissimilar metals, the joint must have an accurate fit, with proper gap dimensions and bevel angles. Care should be taken to avoid melting excessive base material. PULSE current is particularly useful for these applications, as it helps limit the heat input. RAMSOND SUPER 250PY offers a variety of settings and adjustments. 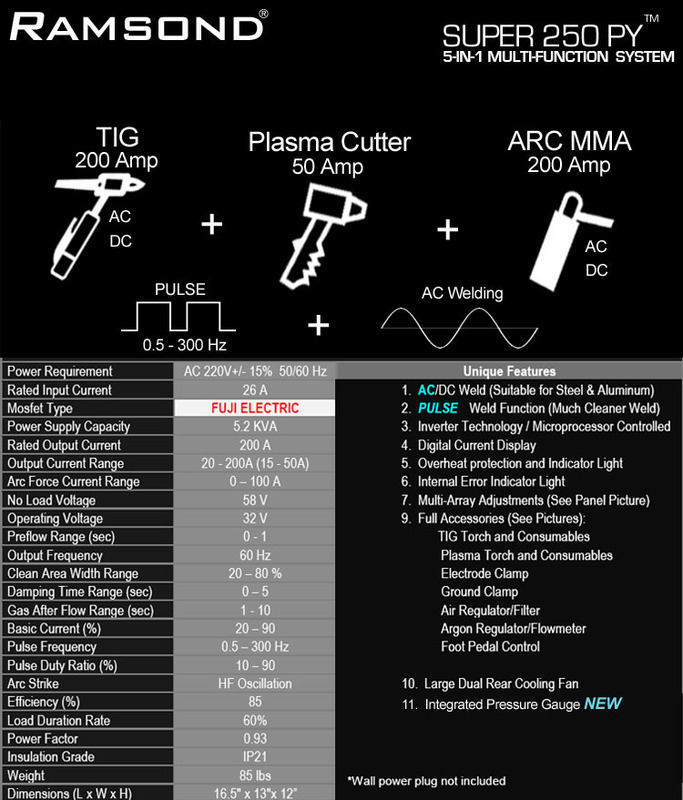 Most of the adjustments and controls on the panel relate to its TIG function. TIG welding, beyond its practical applications, is indeed a form of art. Through experience and practice, each operator develops unique routines and preferences (both in technique and adjustment of the settings) for achieving the desired results. The Ramsond 250PY is equipped with a variety of such control functions and adjustable parameters to suit your welding/cutting preferences. With the proper setting and technique, SUPER 250PY is a precision welding tool that can achieve optimal and professional quality results. Additionally, the Ramsond SUPER250PY features 2 new features that set it apart from its would-be competitors. The outdated models normally are equipped with a pressure gauge that is attached to the air filter located in the rear of the machine. Naturally, with these traditional units, the user must either flip the machine around or walk to the back the machine to view the pressure gauge and setting. Ramsond SUPER250PY has incorporated the air pressure gauge into the front panel of the unit , making it visible from virtually any angle. Additionally, this Ramsond model is equipped with a large digital display that conveniently displays the current setting of the unit. The new SUPER 250PY is foot pedal ready. The foot pedal is included free of charge. 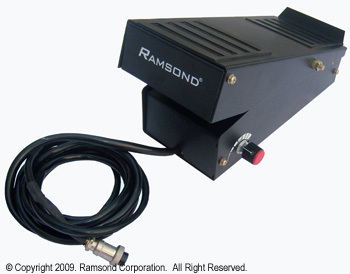 The Ramsond foot pedal controller attaches to the 7-prong connection on the front panel of the unit. Simply leave the 7 prong connection of the torch disconnected and connect the foot pedal 7 prong connection and turn the foot pedal ON/OFF button on the front panel to the ON position. The foot pedal function provides further flexibility to the operator to control the output current (Amp) via the foot controller. The foot pedal is also equipped with the a current adjustment knob on its side. Using this current adjustment knob, the user can set the maximum output current. For example, if the maximum output current is set to 160 Amps (using the adjustment knob of the foot pedal), when the foot pedal is fully depressed, the maximum output current will not exceed 160 Amps. The foot pedal is equipped with a spring loaded retraction system. So lifting the pressure off the foot pedal will lower the output current and ultimately return the current to zero. The foot pedal can be used with all functions, however it is typically used with the TIG function. The production process for Ramsond products is among the most stringent in the world and meets or exceeds some of the industry's most rigid standards. Our studies show that it is in fact among one of the best in the industry and is unrivaled by other would-be competitors. The quality of each of the integrated components is constantly monitored during the course of production. Only components and materials that meet the highest industry standards for quality are permitted to be incorporated into Ramsond products. Finally, upon conclusion of production, each unit is put through a newly devised, far more rigorous 30 point testing and quality inspection routine. This process is critical to ensuring a product that is not only safe, but reliable in both performance and durability. Plasma cutting is a process that is used to cut steel and other metals using a plasma torch. In this process, an inert gas (compressed air) is blown at high speed out of a nozzle; at the same time an electrical arc is formed through that gas from the nozzle to the surface that is being cut, turning some of that gas to plasma. The plasma is sufficiently hot to melt the metal being cut and moves sufficiently fast to blow molten metal away from the cut. The plasma, which is maintained between the work-piece and electrode, travels at over 9000 MILES PER HOUR (15,000 km/Handle). That’s over twelve times the speed of sound. 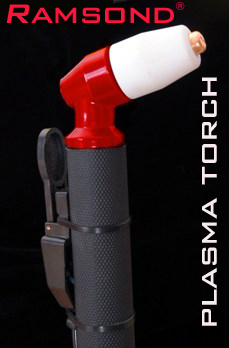 Plasma does not use expensive, hazardous gases, only compressed air. It imparts much less heat into the piece being cut, eliminating warping. It does not require ignition. It leaves little to no slag to clean up or grind off. The cost per cutting hour can be less than oxy-fuel since there is no gas cost. It is also much quicker and easier. So, you cut better, faster and inexpensively. There is not a lot of skill or training required to operate a plasma cutter. The torch should remain at a 90-degree angle. 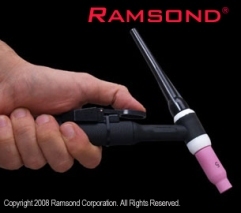 With the Ramsond SUPER 250PY you can keep a standoff or drag the tip of the torch on the metal. The TIG and ARC welding are relatively easy also, however, they do require some practice. 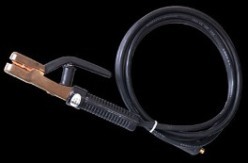 Compressed air is the most popular gas used for plasma cutting. You can use an air compressor or a bottle of compressed air. The CFM (Cubic Foot per Minute) is important because that is the amount of air that will be distributed per minute and will keep your RAMSOND SUPER 250PY running consistently. The PSI (Pounds per Square Inch) is the actual air pressure required to operate your SUPER 250PY (40-75 psi). The other gas often used is nitrogen, but the only advantage to using it is for cutting stainless steel. Although, you will get a cleaner cut, the cut thickness will be slightly diminished. With some exotic metals a gas mixture may be needed. 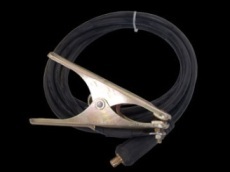 You will also want to have clean and dry air when operating any plasma cutter. Ramsond SUPER 250PY comes already equipped with a 2-in-1 filter/regulator device. 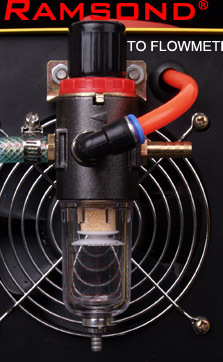 This 2-in-1 regulator/filter regulates the output air pressure and keeps the air dry and clean. Dry air is important because if there is moisture in the line it will travel with the air and exit the end of the torch. This is not necessarily dangerous but will shorten the life of your consumables because the arc will follow the moisture in all directions and erode the tip prematurely. The Air Filter/Regulator attaches to the rear of the unit. The knob on top of the regulator adjusts the output air pressure. You can see the pressure on the pressure gauge installed on the front panel. By turning the knob, the output air pressure can be adjusted to your desired level.The filter/regulator also removes dust and moisture from the compressed air. You may see water collected in the glass bowl of the filter regulator. This means that your compressed air source contains moisture which was filtered and collected by this regulator/filter. If you see accumulation of water in the glass bowl, do not be alarmed, simply pull on the drain/safety pin located on the bottom of the bowl to empty out the water. 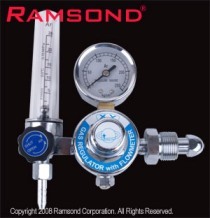 Included with the RAMSOND SUPER 250PY is an Argon Regulator and Flowmeter combination which accommodates highly precise adjustment of gas flow for the TIG function of the unit. The use of flowmeter provides more accurate readings than regulator gauges, therefore, substantially reducing gas waste. The included regulator is equipped with a STANDARD (CGA-580) connection suitable for use in US and Canada . The SUPER PY inverter rectifies the input voltage (220V) into DC (Direct Current), which is then fed into a series of MOSFETs (Metal Oxide Semiconductor Field Effect Transistor). 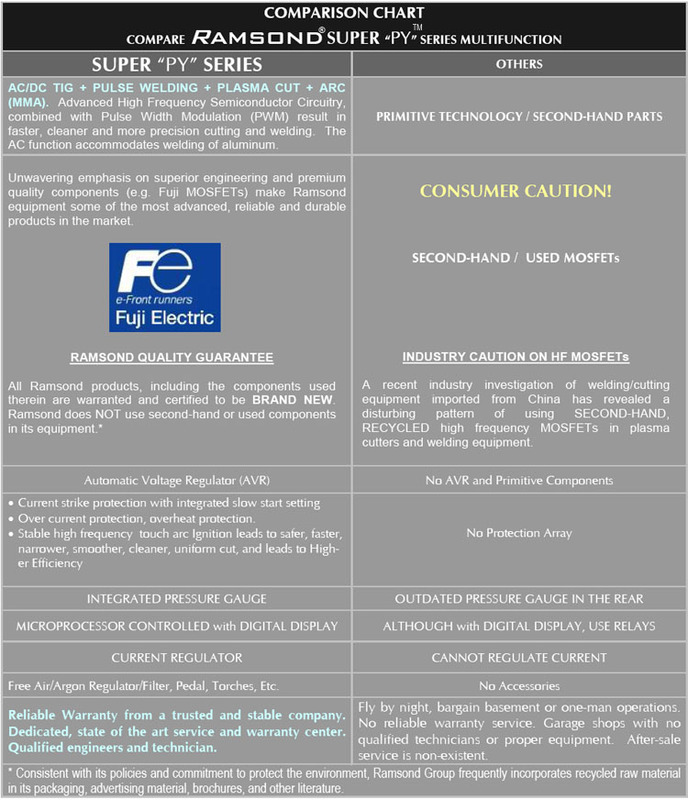 Ramsond SUPER PY series machines utilize the most advanced FUJI (for Super 250PY) or TOSHIBA (for Super 160PY) MOSFETs. These MOSFETs (transistors) are switched at thousands of Hertz, which greatly reduces the magnetic flux, and therefore the size of the transformer. In simple terms, MOSFETs allows for a compact and light weight machine such as the SUPER 250PY to operate at its performance parameters. The use of these MOSFETs makes it possible for SUPER 250PY to produce the necessary power, using very little space and creating minimal heat dissipation. 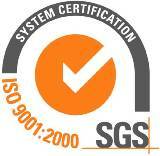 A 1 year Limited Manufacturer's Warranty is furnished with this product. This limited warranty provides for both PARTS and LABOR at Ramsond's certified repair service center. Ramsond has a complete dedicated service center for its line of welding and plasma cutting products. This service center is equipped with state of the art technology which accommodates proper service and maintenance of these units. 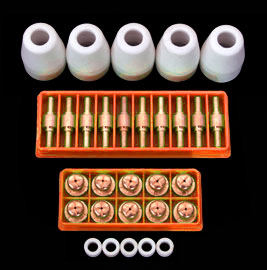 We consistently maintain a large inventory of consumables (electrodes, tips, cups, shields, etc.) which are available to our customers. For sales, customer support or other inquiries please feel free to contact us during normal business hours at (248) 363-8302 or via email at sales@Ramsond.com.. I was a little hesitant at first to purchase a multi unit. I'm glad I did. This light weight portable unit is awesome. I've been a welder for over 25 years and I must say I am very impressed with the ease of use and how smooth it welds. I have had a few problems with the plasma cutting but, more user error than machine. The stick and tig options are very easy to set up and weld beautifully. Solid machine and I would highly recommend it. I've waited long enough to review this machine. It has been a joy to work with. The plasma cutter took time to get used to, but I'm not proficient in cutting with it and remembering to switch from mode to mode, and hooking up the compressor. I've cut through 1/2" plate fairly well. Stick welding shocked me, I really couldn't believe how well it welds, hardly any spatter and good penetration. I was able to vertical weld which I hardly could do at all with my Lincoln stick welder. Tig welding was fun, I managed to weld a soda can bottom ridge well and laid down a 3/8 bead on scrap stock easily. getting used to the pulse welding takes time, but well worth the effort. All in all, I am very impressed with this machine and as long as you make a long enough extension cord, it's reasonably portable, I can't find any real issues other than remembering to make sure you flip all the switches before you start working with it. (Highly recommend this unit) especially if you're already a welder and you need an all around machine at home.